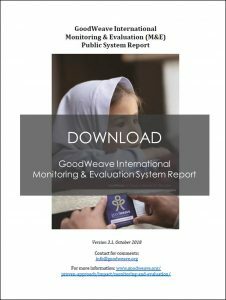 GoodWeave’s Monitoring & Evaluation (M&E) system, built and administered in accordance with the ISEAL Impacts Code, helps to ensure that the organization is meeting its objectives and carrying out its larger mission of ending child labor, forced labor, and bonded labor in a manner that is both wholly transparent and open to further development. Internal monitoring allows us to gauge our progress in realizing many of our short-term desired outcomes, such as removing children from manufacturing supply chains and placing them in safe, rehabilitative environments—progress that can be measured by tracking the number of production sites inspected during a given period, for example, or the number of children withdrawn from the workplace. To help us determine how well we are achieving our medium-term and long-term goals, we initiate in-depth evaluations that analyze dynamics in labor markets and social conditions in communities. At both levels, we bring to the task of self-analysis the same rigor and scrutiny that we bring to the task of monitoring and evaluating supply chains and worker environments. We have an extensive collection of online resources for those interested in learning more.